March 6th, 2011 Grazed & brown goose paddock next to fresh & green paddock. I love grass. It feeds the animals and keeps things nice & clean. 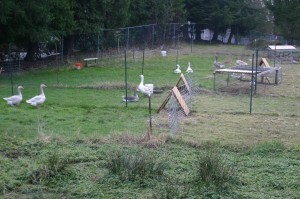 The geese love it too, and will eat it down to the roots if they are on it long enough. The challenge is: How do you keep fresh grass around a nesting goose, without moving the nest? I do it by putting the nesting shelter in the middle to the paddock, and then splitting the paddock in half with a temporary fence. 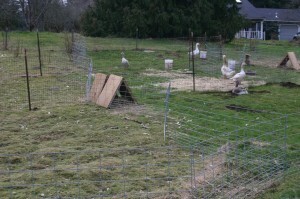 When it’s time to shift the geese to the other side, I move the temporary fence over to the other side of the nest. 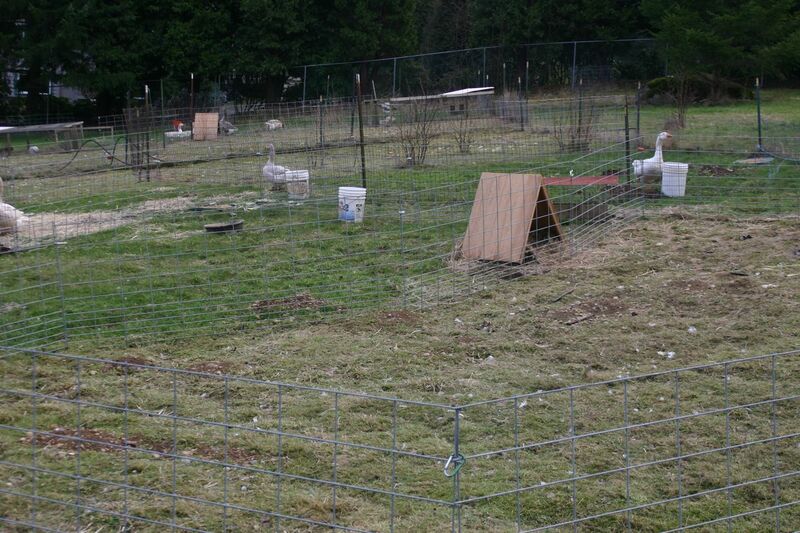 This puts the nest on the “green” side of the paddock without having to relocate the eggs or the sitting bird. March 6th, 2011; Each paddock is split in half to allow the grass to recover. This kind of “movement” is what Joel Salatin describes in the article he wrote in the March, 2011 issue of Acres magazine. In my paddocks, each nesting pair gets about 400 square feet at a time. This means there is 800 square feet of paddock split in half. During February, the grass lasts about 3 weeks under 2 geese before it’s pretty grazed out. I decide when to “flip” the paddocks based on how well the grass on the resting side has recovered. As the weather warms, and the grass moves into the “spring flush”, the timing speeds up. Sometimes as fast as once a week for the 2 birds. I would like to go faster, but with a 2-paddock rotation, that’s about as good as you can do. Fresh grass on the left side, grazed hard on the right side. On April 20th, we had our first nest-hatched goslings appear. Our lavender pair hatched 7 eggs. After 5 days, it was time to move them to new grass, so I did. The goose and gander are important to protect these little birds, and I’m glad to have the routine in place where they can grow up under their parent’s watch. 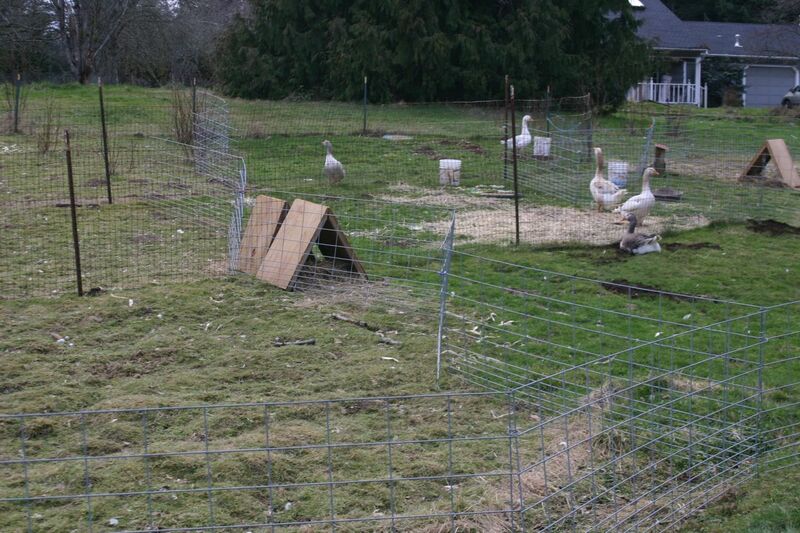 This entry was posted in Farming, Geese, Grazing and tagged Geese, grass-fed. Bookmark the permalink.